The main deck layout of the 58 Fly, although similar to the 56, will also offer much more space with a larger dinette, while the stern galley will be much more open in style. Below deck the Absolute 58 Fly will offer a layout with three double cabins and three heads, with the option of a fourth, supplementary aftcabin that can comfortably house a crew member. All cabins feature large windows offering panoramic views. Of course, even the characteristic good looks of the 58 can’t overshadow the quality of build in an Absolute. The formed hull is supported and strengthened by Absolute’s version of a grid stringer system called ISS for Integrated Structural System. This ISS is laid in place, then bonded to the hull. Then the decking, bulkheads, etc. are brought in and are then all bonded together. The result is a single structural component with surprising strength. This is what gives the Absolute its characteristic solid feel. The swim platform is offered with a hydraulic option that can launch a tender or PWC and even has the ability to serve as a private beach when partially submerged. The entertainment value of the platform can be further increased with the addition of an optional transom grilling station with sink, all under a protective fiberglass cover. A door to the port side of the platform leads to the optional crews quarters. If this option is not selected, then the space is used for storage. The crew version includes a berth mounted athwartships across the stern with a transom window. To the port side, we can continue from the entry, straight ahead through a small head with sink and toilet. It also serves as a wet-head with a hanging shower wand and pull-across curtain. Regardless of which version is chosen for this aft space, continuing forward will lead to a watertight door to the aft bulkhead of the engine room. With twin 600-hp Volvo Penta IPS800 engines powering the 58 Fly you can expect to reach top speeds of 30 knots at 2950 rpm. Not surprisingly, with IPS propulsion that top speed also coincided with the best economic cruise. A 63.5 gph fuel burn translates into 0.5 nautical miles per gallon and a range of 221.7 nautical miles, all while still holding back a 10% reserve of the boats 528 gallon (2,000 L) total fuel capacity. The 58 Fly’s use of space from the original design standpoint was a paramount consideration for Absolute, and it was executed well. There is virtually no wasted space from stern to bow. Of course, all this gets coupled with the rakish design that gives the entire product line its well-recognized sleek styling. 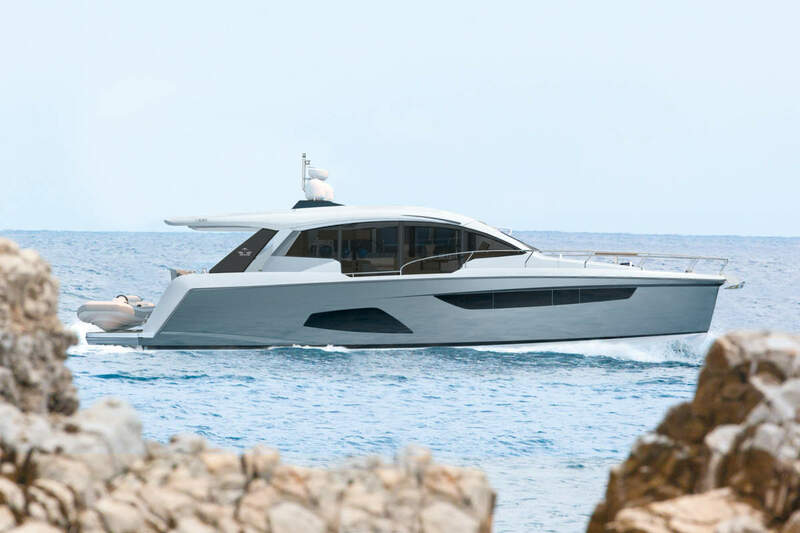 We think Absolute have produced a well thought through addition to the line up and it’s a whole lot of boat for under 60 feet.